This is a new wine. 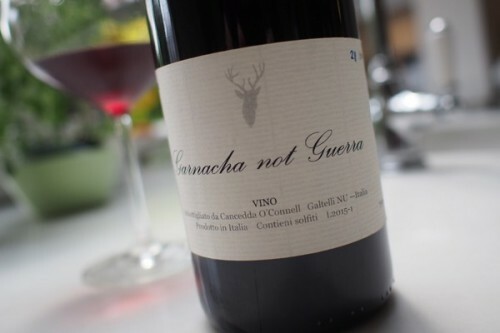 Naturally made Garnacha (deliberately chosen as the name to indicate a style difference, rather than the local Cannonau), just 360 bottles produced! It’s such an indulgence to write about wines like these, but this is what keeps wine interesting. It’s just great that someone cares enough about wine to make the special effort to do a project like this. The grapes come from northern Sardinia, and Mick O’Connell, who works with Handford, and his partner, managed to blag some grapes and then pick a couple of weeks before all the locals to produce this wine (5 kg picked 29 August for pied de cuve, then 500 kg picked 31 August) which is made whole bunch (foot trodden in fibre glass tank, but one fifth done carbonic), then basket pressed into two glass demijohns. There was some temperature control: evian bottles were frozen and then suspended in the tank at the most violent part of ferment. No sulfur dioxide is added, save for a tiny bit after malolactic fermentation and a bit at bottling (free is 5 ppm and total 13, which is super-low; pH 3.57), and it weighs in at 12.9% alcohol. This is what is great about natural wine: picked early, super-smashable, but with a hint of seriousness. Very few people will be able to get this wine, but it shows the potential of warmer regions such as Sardinia to make amazing wines, if the culture of the growers changes. Europe has astonishing terroirs that are largely currently not being used properly. I’m confused. Recently you took a certain wine writer to task for suggesting that Provence is cheapening itself by making too much rosé. And that a certain American importer has the gaul to suggest how France makes its wines. Yet you go one large step forward to claim that Europe (all of it) is not properly using its terroirs. I assume you agree then that Provence is not properly using its terroirs for whatever reason. Interesting. I am very few people.